Stewed Tomatoes is the first recipe we made when we started this project (photo at the bottom of this post). Over a year later, we are nearing the end of the project and remaking some recipes for photo upgrades before we go to print. One of our dinner guets suggested the sprig of basil for contrast and I think the photo turned out very well (as did the dish). Peel the tomatoes by placing in boiling water in a stock pot for 2 to 3 minutes or until skins start to separate. Remove tomatoes from water and let cool. 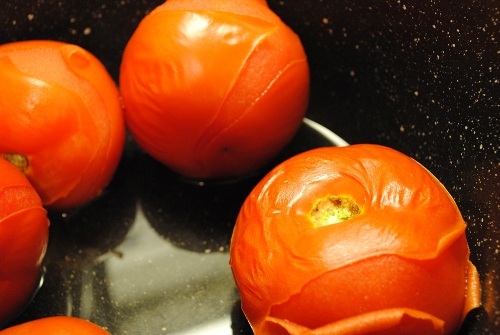 Pull skin off tomatoes and discard skins. In the same stock pot used to boil the tomatoes, heat the vegetable stock over medium heat, this will only take a minute. Add the tomatoes, Worcestershire, and sugar to the stock pot. Turn the heat down to low and stew tomatoes for 15 minutes uncovered. Add salt and pepper just before serving. 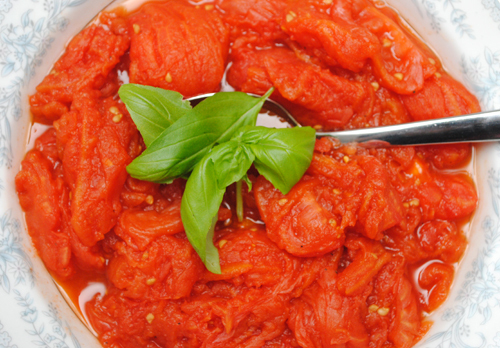 Use a slotted spoon to transfer tomatoes to a serving dish. Serve warm as a side dish.